Tasty Recipes Pepes Ikan Patin Tempoyak .Never tasted fish dishes with a combination of fruit durian? Here is a processed fish dishes combined with fermented durian or called tempoyak. 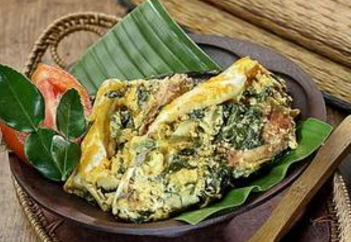 His name is steamed catfish tempoyak, dishes typical of this archipelago has the flavor and aroma are very tasty. In addition, catfish also contain more protein compared with other freshwater fish. So that consume catfish very well for the health of the body. For those of you who love the cuisine of catfish, try the recipe spiced catfish tempoyak this one. Prepare the local durian ripe for tempoyak dough. Separate durian flesh from the seeds and then sprinkle a little salt. Add cayenne pepper to accelerate the fermentation process. After 3-5 days, be tempoyak food fermented durian fruit with sweet and sour taste for the sauce and blend recipes fish. Combine seasoning that has been mashed together with tempoyak until evenly distributed. Pour the mixture and rub the fish with herbs and tempoyak evenly. Let stand for ± 1 hour so that the seasoning is more pervasive. Prepare banana leaves then wrap the fish that have been coated in herbs and tempoyak. Steamed or oven for ± 20 minutes or until cooked. Remove and serve. That dish steamed catfish with durian fruit flavors blend in the flavor of the delights of processed catfish. Get more savory fish recipes just in makanajib.com , tasted delicious feels solid . Enjoy your meal! 0 Komentar Untuk "Tasty Recipes Pepes Ikan Patin Tempoyak"